Once you've snagged a job interview, the inevitable nerves that follow can make it difficult to focus on preparation. With a little bit of planning, though, you can bring your best business-ready self to the table. Follow these tips leading up to your big moment. It's important to have a healthy, substantial breakfast, of course, but it's just as important to eat well the night before so that you feel your best in the morning. Choose nutritious foods that fill and satisfy, and remember to limit caffeine to one or two servings. Chances are you'll already be feeling jittery, so put a cap on your coffee consumption. Check the hourly forecast and grab any extra items that you may need: an umbrella, a raincoat, gloves, or suitable footwear, for instance. Shoes are important: make sure your pair is both weather-appropriate and easy to walk in, because the last thing you want to do is trip your way through the office. The night before your interview, wear the selected shoes with socks for a couple hours to guarantee that they're broken in and comfortable. Pack a small bag with all the hygiene necessities: floss, travel-size deodorant, a compact mirror, and any makeup essentials that you may want to use for a morning touch-up. Include a tin of mints and avoid gum in case you forget to throw it away beforehand. Call a friend for a quick conversation that will place you in a lighter frame of mind. Try not to talk about your interview. Instead, focus on carefree, upbeat topics that will put you at ease. Turn up the volume to amp up your energy. Nobody wants to talk to a tired deadbeat, let alone hire one. Companies want lively, enthusiastic employees, so listen to a special pump-up playlist featuring your favorite fast-tempo songs. Let yourself loosen up so that your personality can shine. Turn off your phone. It's a no-brainer, but nothing screams "unprofessional" quite like a vibrating purse — not to mention a loud, awkward ringtone. Drink up: hydration is key to staying alert, so bring a full water bottle to sip throughout the day. Once you reach the office, kindly accept any drink offers from the receptionist in case your mouth dries out midinterview. Take deep breaths, inhaling through your nose and exhaling through your mouth. Anxious butterflies can cause headaches and hazy vision, so concentrate on breathing to clear your mind. Attitude is everything, and positivity packs the greatest punch when it comes to boosting your appeal. 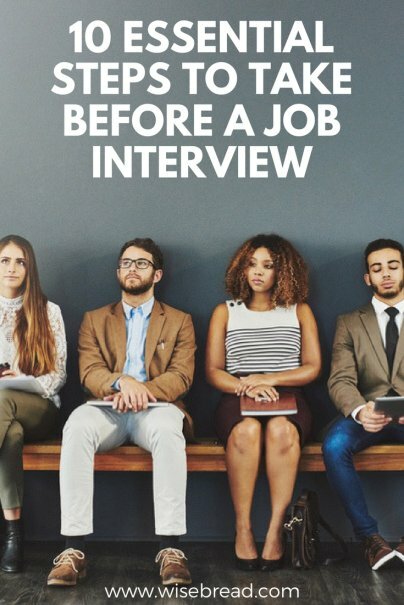 Have your own interview prep tips to share? Leave them in the comments.